Today, 3M (MMM), a global science and innovation company, revealed the findings from its 2019 State of Science Index (SOSI), a third-party, independently researched study. A survey of about 14,000 people across 14 countries, the study is designed to gauge shifting global attitudes toward science. Ultimately, amid hopes for the role science plays in creating a brighter future and its potential to solve global challenges, the survey found that scientific skepticism has grown, leading 3M (News - Alert) to conclude that science needs advocates now more than ever. The survey reveals that 87 percent of the global community believes we need science to solve the world's problems, and a majority also believe the best days of science are yet to come (62 percent). However, skepticism of science grew three percentage points globally and six percentage points in the United States last year (from 27 percent to 33 percent), with nearly half the world stating they only believe in science that aligns with - and likely reinforces - their personal beliefs (45 percent). The survey also reveals only 20 percent of people stand up for science when debating its merits with others. One theory to explain this contradiction is that supporters of science may not be aware there is a need for advocacy. The study points to challenges and opportunities to increase science appreciation. Nearly three-quarters (70 percent) of people rarely, if ever, think about the impact of science on their everyday lives. On the bright side, the sentiment toward science is mostly positive, despite the growth in skepticism. A clear majority report science makes them feel curious (72 percent) versus indifferent (18 percent) or intimidated (10 percent). And, while 85 percent of respondents admit they know little to nothing about science, the same percentage wish they knew more. The State of Science Index suggests connecting the dots between science and its positive impact on humanity is an important driver of interest in and support for science. "The vast majority of people see the same opportunity with science that we see every day at 3M. The world needs science more than ever to help solve the toughest challenges facing the planet," said Mike Roman, 3M's chief executive officer. "At the same time, science needs advocates who can unite to show how the field makes a difference in people's lives. At 3M, we are strengthening our commitment to creating a better world through our own technology capabilities, while inspiring others to see the power of science, including our significant investments in STEM education. For nearly 50 years, 3M has created and funded programs to support STEM education, promote STEM equity and develop the workforce of tomorrow." Those who indicated they are interested in science are most likely to be fascinated because they believe scientific advancements will benefit future generations (59 percent); science will solve major world issues (42 percent); and science will help them live a longer, healthier life (40 percent). The majority of people (87 percent) also are excited for (rather than afraid of), medical advances that will eliminate chronic diseases like cancer and are likewise excited by the prospects ofspace travel/tourism (71 percent). Building on making science and scientists more universally appealing, the survey reveals an opportunity to break down barriers to science comprehension and appreciation. The primary barriers are accessibility and relatability, both of which can be solved via communications best practices. The majority of people agree scientists should make science more relatable to their everyday lives (84 percent) and talk about it in a way that is easier to understand (88 percent). Furthermore, 80 percent of people are more likely to believe information that comes from someone who works in a scientific field, rather than to be skeptical of it, but more than half (58 percent) believe scientists are elitists, which presents an opportunity for scientists and science communicators to connect with audiences in new ways. "We all benefit from science, but it takes effective communication to make science more relatable," said Dr. Jayshree Seth, Ph.D., corporate scientist and chief science advocate at 3M. "We know the science community does a great job communicating with each other, but the world needs scientists to talk about their important work to highlight the benefits to society. By making science more relatable, we can reduce skepticism and fear, helping to foster a new generation of scientists and science advocates. I am encouraged by people who trust scientists and that 85 percent of people wish they knew more about science. But with skepticism of science growing worldwide, now is the time to stand up and take action in support of science." Continuing the theme of human interest, the study found most of the world places a higher value on humans than artificial intelligence (AI). The survey posed a series of questions to determine people's preference for human or digital connection. Almost everyone (87 percent) would choose to make five real friends rather than attract 5,000 new followers on social media*; 64 percent would opt to own a regular car over a self-driving car; and 74 percent would rather have a human assistant than a robot assistant. AI also generates some fear about the role of science and technology in the future, with more than half (52 percent) citing the role of robots in the workplace as something that makes them feel afraid rather than excited. 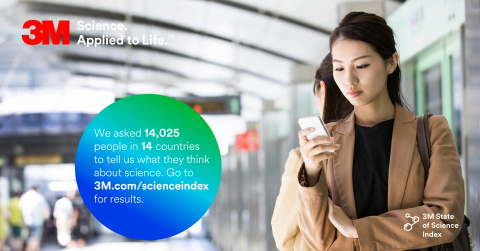 "This year's State of Science Index reveals that many people around the world are skeptical of science, even as advancements in technology attempt to drive positive changes in society," said John Banovetz, senior vice president and chief technology officer at 3M. "As we think about better communicating science breakthroughs and their potential positive impact, we need to focus on the benefits to mankind and show how science and technology improves lives. Science promises we can address our most difficult global challenges - and by doing so, we create a brighter, more productive, and healthier future for the next generation." Throughout the year, 3M will partner with various organizations to advocate for science and STEM initiatives, and 3M's Chief Science Advocate, Dr. Jayshree Seth, will continue to champion science through content and speaking engagements, in the United States and abroad. Full study data, including individual country breakdowns across 14 countries and the ability for individuals to explore the data further can be found at 3M.com/scienceindex. Global research firm Ipsos conducted the study of 14,025 adults across 14 countries July 13 - September 10, 2018. The survey was fielded through a combination of online and offline interviews. Approximately 1,000 people aged 18+ were surveyed in each country. Countries in the study include: Brazil, Canada, China, Germany, India, Japan, Mexico, Poland, Singapore, South Africa, South Korea, Spain, United Kingdom, and United States. The sample for each country was nationally representative based on age, gender, region, and race/ethnicity (where applicable). The precision of Ipsos online polls is measured using a credibility interval. In this case, the poll has a credibility interval of ± 0.9 percentage points for all respondents. Any reference to global changes in the data over one year (e.g. increases/decreases since last year) is derived from the average of the same 12 countries included in the survey each year, which are Brazil, Canada, China, Germany, India, Japan, Mexico, Poland, Singapore, South Africa, UK, US. *Asterisk (News - Alert) indicates that the data cited excludes "prefer not to answer" responses. At 3M, we apply science in collaborative ways to improve lives daily. With $33 billion in sales, our 93,000 employees connect with customers all around the world. Learn more about 3M's creative solutions to the world's problems at www.3M.com or on Twitter (News - Alert) @3M or @3MNews.